I'm probably speaking too soon, but it really feels like spring has arrived. The sun is out, blossom is blossoming and some long awaited goodies have started reappearing in the market. It promised to be a weekend jam-packed full of the joys of spring. And so it proved. Me: Something martini-ish, I think. Not really sure. Lukas: What spirit would you prefer? Lukas: Hmm.... Gin I think. And you know what? He was right. I can't remember what he called it but it was spot on. We stumbled inevitably from here to a casino, a confusing, warren-like modern establishment tacked on to a hotel in Paddington, where, despite our best efforts, they stubbornly refused to run out of chips. Fuzzy headed but with a spring in my step and a few quid to the better, the next morning it was off to Borough to see what I could find to cook for Alice, who was coming round for dinner in the evening. I had a recipe in mind but wasn't going to mind too much if the market had other ideas. In the end, though, it worked out pretty much exactly what I had planned: some very early and squeakily fresh Isle of Wight asparagus, luxuriously velvety Jersey Royals (also the first of the year), a bag of kale tops, which proved to be an absolute winner quickly fried in a little olive oil and salt and finished with a little butter) and a regal sea bass crisped up in a pan before being steamed through on a bed of mixed herbs (a winning Gordon Ramsay Secrets recipe). Sweet, ginger infused rhubarb with fresh custard to follow and a couple of bottles of Chablis Premier Cru to wash it down. Fantastic. And on Sunday a jaunt across town to Notting Hill to plan Godchild number three's baptism party later in the month. This, clearly, was a thinly veiled excuse to go out to lunch. So we did, to the Mandarin Kitchen on Queensway. 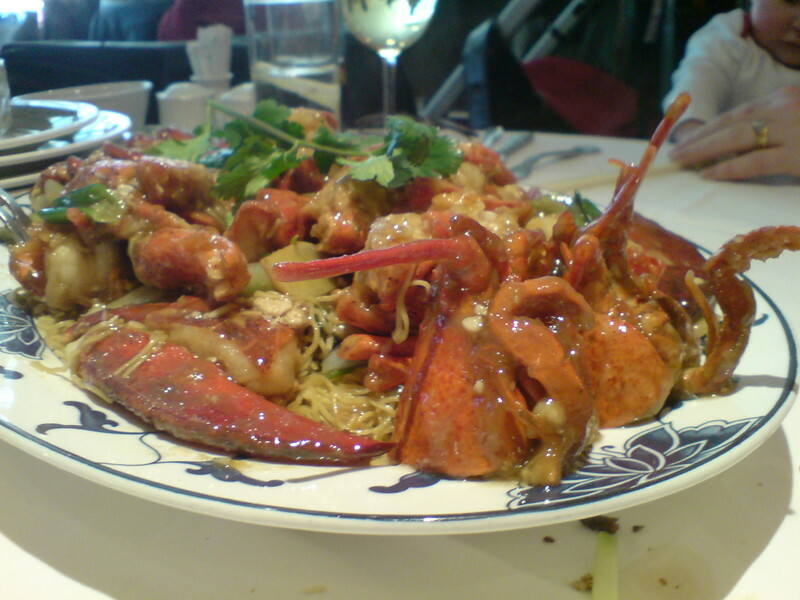 This is a well established, fairly standard Chinese (in an area not short of such places) that tries to rise above the competition by putting more emphasis on quality seafood, particularly lobster. The service has a bit of a lousy reputation but that wasn't a problem for us. Mind you, most of the staff seemed to be on first name terms with Neil and Jaq and they knew before we got through the door what wine we'd be having, so this may not be exactly laboratory conditions. The food was good. Starters included some mildly spiced Peking ravioli, a couple of soft-shell crabs and an entire litter of baby squid. Steamed prawns were bland and overcooked, the only real let-down. Crispy duck was crispy duck, and the spectacular signature dish of lobster and noodles was a feast for the eyes, if not necessarily the tastebuds. Nothing wrong with it, as such, but maybe not the most sympathetic treatment for lobster (but then I'm habitually disappointed by lobster, anyway, so maybe I should let someone else be the judge). Overall, an indubitably fine way to while away a couple of hours on a Sunday afternoon. I look forward to doing it again. All that then remained was a slightly unnecessary trip to the ever-entertaining Beach Blanket Babylon for more cocktails, and a wobbly journey back across town. All in all, what with one thing and another, not to mention the return of Doctor Who, just about the perfect weekend. Converted to gin at last? I feel vindicated.